A complete range of Irish oak fascias in 9mm or 17mm and the 9mm flat board and 300mm tongue and groove soffit to suit. Product Dimensions: 5m long and various widths. Product Thickness: 9mm with a return leg of 38mm on the lip Accreditations: BBA & BSI Approved Guarantees:10 year Manufacture Guarantee Product Type: uPVC 9mm Irish Oak Reveal Liner ..
Irish Oak Shiplap Cladding. 150mm Woodgrain .. Product Dimensions: 5m long and various widths. Product Thickness: 17mm with a return leg of 32mm on the lip Accreditations: BBA & BSI Approved Guarantees:10 year Manufacture Guarantee Product Type: uPVC 17mm Irish Oak Reveal Liner .. Product Dimensions: 5m long and various widths. Product Thickness: 9mm thick Accreditations: BBA & BSI Approved Guarantees:15 year Manufacture Guarantee Product Type: uPVC 9mm Irish Oak Reveal Liner ..
Irish Oak Soffit H-Section for uses with hollow soffit or fascias. Comes in 5 metres. For 10mm. .. Product Dimensions: 500mm long Product Width: 50mm Accreditations: BBA & BSI Approved Guarantees:10 year Manufacture Guarantee .. 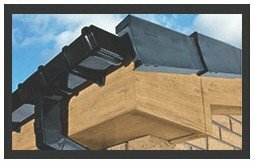 Product Dimensions: 500mm long Product Width: 50mm x 50mm Accreditations: BBA & BSI Approved Guarantees:10 year Manufacture Guarantee ..
Tan plastic headed Pins and Nails are ideal for fixing Light Oak and Irish Oak fascias and soffits into timber joists. Made of high-grade A4 316 Marine grade stainless steel to prevent rusting and discolourations of fascias and soffits. For 16mm fascias boards, we recommend using 2 x 65mm Tan P..
Tan plastic headed Pins and Nails are ideal for fixing Light Oak and Irish Oak fascias and soffits into timber joists. Made of high grade A4 316 Marine grade stainless steel to prevent rusting and discolourations of fascias and soffits. For 16mm fascias boards we recommend using 2 x 65mm Tan Po..